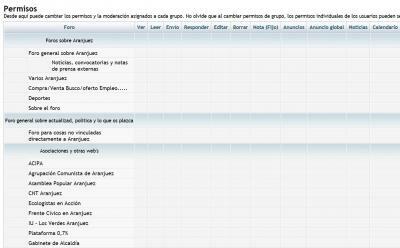 Hello, I asked a few days ago ICY Spain but I have no answer, I have to try another language but nothing, the problem is the forum, comes from the last update and you do not leave the tabs in Advanced mode (in permissions) to change them one by one. Out the box without a choice. Again .. please give Spydie a fair chance Pauso, he already replied once and probably will do again. You may have some tables corrupted, try tu run some DB Maintenance from ACP (make sure you are main admin, otherwise you will not be able to run that) and then empty cache. Let me know if it fixes your issue. I followed your instructions but it didnt work out. Im just thinking that maybe I could set up a paralel forum and give the permits from there while we find another solution. But I need to know which tables from my current database I would need to import from the new forum if I set up that one in order to give the permits to the users on those tables and then setp them up again in the old forum. The problem is quite strange, and there is no easy solution. If you don't have too many special permissions, you can try to reset all forums permissions with the "Permission ADV" page and then empty the table "phpbb_auth_access", but please understand that this will reset all your forum permissions and auth, you will have to reset everything manually! Make a backup before trying this way.